The Great Zucchini (a.k.a. Eric Knaus) shares the secrets of his success. This DVD is Eric's lecture from the Kapital Kidvention, a convention dedicated to children and family entertainment. It was voted the #1 lecture of the convention... and now you can see it for yourself! In this lecture, Eric reveals his branding strategies and marketing tips, as well as his silly routines and kid-tested gags. 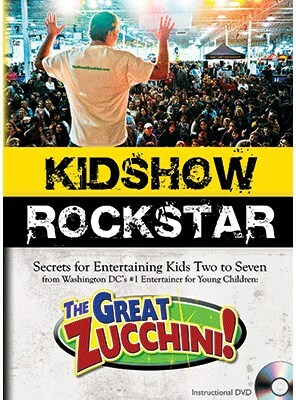 Watch it and you'll discover how and why Eric quickly became -- and remains -- the top Pre-K entertainer in Washington, DC. This DVD is over 90 minutes in length and features his full live lecture as well as bonus footage from his show. These intercuts of actual performances with kids audiences is very illuminating and will help you see his techniques in action and understand why he is a "Kid Show Rockstar" and how you can be one, too! Get this DVD and elevate your show and reputation in your community as the #1 kid show entertainer for the nursery school-aged set.